Twice this year I’ve been astounded by the carefully crafted work of a non-fiction artist. The first, which I’ll mention later, I’ve recommended or gifted to a smaller subset of those who value my opinions. This book, however, is one that I not only recommend, but will heartily insist that you must read. 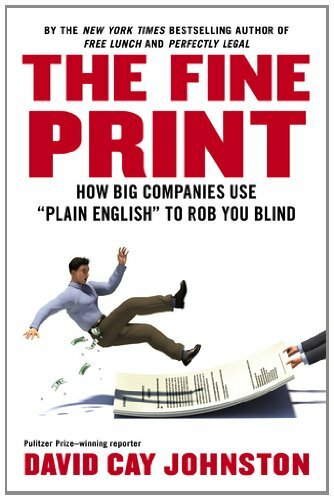 I think any citizen who reads The Fine Print: How Big Companies Use “Plain English” to Rob You Blind will join me in becoming an evangelist for the book. Fair warning: This is the definition of a book for progressive thinkers who know that our system is busted but can’t quite pin down all the ways our commercial society became so inequitable. David Cay Johnston, a former columnist for Reuters, has cataloged the way that “regulated” industries are ripping us off every day, week, month, and year. Previously he did the same to government subsidies in Free Lunch and to our tax system in Perfectly Legal, both of which you’ll want to dive into after reading The Fine Print. On consultation, I’ve decided that rather than reviewing Johnston’s latest, I’ll summarize it, chapter by chapter, because I know that most of you won’t actually read the book. Still, these are facts you need to know in order to be an effective citizen. Honestly, there’s little that is partisan in this book, though it’s ideological slant is purely populist. If you don’t find yourself disgusted (and a bit overwhelmed by the stakes and the odds) after reading this series or this book, then I probably don’t know you. Herewith, then, is installment 1. Most readers will remember the Justice Department’s breakup of AT&T in 1974 and how that antitrust action would usher in an era of competition that would drive the cost of telephone service inexorably downward. Even before the monopoly was shattered, another corporate giant, the Southern Pacific Railroad, began offering a competitive long-distance service by making use of its already existing rights-of-way and microwave communications towers. SP’s service morphed into a company we now know as Sprint/Nextel (SP. Get it? ), piggybacking on the railroad infrastructure to lay fiber-optic cable. Here enters Bruce Kushnick of Brooklyn, New York. While visiting an aged aunt, Kushnick stumbled upon a trove of 20 years worth of her telephone bills. In 1984, she was billed $9.51 for local service. By 2003, her local service bill had grown to $38.90. Not for long distance. Not for Internet. Just for local service. Not exactly the direction promised by the champions of the 1974 breakup. Beyond the amounts, Kushnick was struck by the growing complication of his aunt’s bills as the years passed. Fee on fee on fee were showing up; many of the charges were for “features” she couldn’t even use with her equipment. Here’s a list of the incremental gains, all approved by regulators, that the telecom companies achieved in order to fulfill the forecasts Liepzig heard. “What Liepzig and Kushnick encountered were early signs that the lower prices made possible by competition and digital technology were just empty promises. This involved more than money, since the telephone industry, together with the cable television industry, quietly saw to it that written into the fine print were laws and regulations that made it easier for them to minimize their investments in new technology and to serve only the customers the companies wanted. The “toll road” thus erected is extremely profitable. OK, folks. That’s a taste. Allow me to share just one scam that robs you of cash, services, and quality of life. Next time: Corporations were given protection under the 14th Amendment to the Constitution not by new legislation, not by a court ruling, but by a one-paragraph assertion in the case of Santa Clara County v. Southern Pacific Railroad, made by the clerk of the court, who just happened to be the former president of – you guessed it – a major railroad company. I’ll be more concise in coming installments because if you found this interesting, you’re going to want the book, for sure. For a limited time, I’ll be giving a $10 gift certificate, good for use in 2013, with every purchase of The Fine Print. Correction: This piece referred to the author as a current reporter with Reuters. He informs me that he was a columnist for that organization, but is no longer associated with Reuters. Thanks for the really kind words about my new book, but to keep the record straight I was a columnist (not reporter) for Reuters, but no longer work there. Anyone who reads The Fine Print and would like to arrange for me to talk in their city can reach me at davidcayjohnston@me.com.